It is the third day of the SID 2011 expo in Los Angeles, and it looks like high-res pocket-sized displays are not everything that Toshiba has to show off there. The Japanese manufacturer has one more trick up its sleeve – an 8-inch glasses-free 3D display with a resolution of 800 by 480 pixels that seems to be a perfect candidate to debut on a tablet device. What makes this display stand out? Well, besides not requiring any glasses to see images in 3D, Toshiba's display does not suffer from any loss of resolution like some other glasses-free 3D displays. In comparison, those on the HTC EVO 3D and the LG Optimus 3D need to show interlaced images in order to create the depth perception effect. Toshiba achieved this by using a special time sequential technology that similarly to other techniques, alternates between the image that your left eye and the image that your right eye is supposed to see. Unfortunately, the 3D effect fades out when the display is viewed at an angle. That is a drawback that seems to plague parallax barrier 3D screens as well. It has not been confirmed that the display will ever make it to a device of any kind, but a glasses-free 3D-enabled tablet will be quite interesting to see. In the meantime, feel free to see the video of the display in action. And no, there will be no dinosaurs jumping out of your screen, sorry. amen to that... i want a glasses free 3D tv! 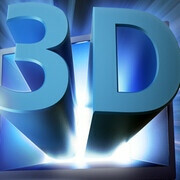 There are two televisions that are going into production that are glasses free 3d. A 55inch and a 65inch. They were shown off at this years ces.